This powerful Brightening Serum is then administered with the Epicell Boosters to deliver the active constituents of micro-molecules deep into the skin through atomisation. Alpha Arbutin is a safe and natural alternative for the lightening of skin discolourations. Arbutin is a ‘non-phenol’ – meaning to say, it does not cause damage to the skin through bleaching or chemical burn. It is a natural compound extracted from various natural plant resources such as bearberry plant, blueberries, cranberries, pear skins, and wheat. This compound inhibits the tyrosinase activity thus blocking epidermal melanin biosynthesis. 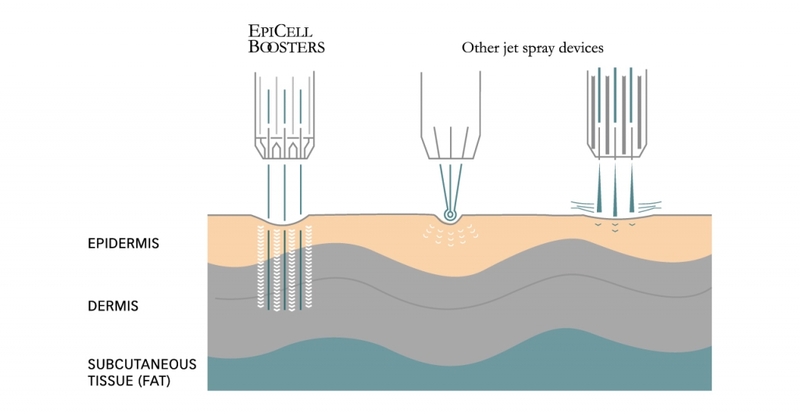 This revolutionary technology uses air pressure to form a strong jet wave to deliver the Stem Cell serum at a speed of 450m/s. This high pressure will open skin pores, without damaging the surface, to deliver the active constituents of micro-molecules into the deeper layers of the skin through atomisation. This procedure stimulates collagen multiplication, regenerates cells, repairs cells to minimise wrinkles, scars, spots and marks, brightens skin, lightens pigmentation, tightens and lifts skin. With the high pressure and speed, it also helps to clean pores, removing blackheads and sebum.